This zesty salad is perfect for easy weekday lunches. And once the weather really shapes us, it would work well on a picnic, too. Cook the pasta according to the instructions on the package, adding the green beans in 5 minutes before the end of the cooking time. In the meantime, hardboil your eggs (8-12 minutes). Once cooked, rinse them under cold running water, peel them and let them cool. Drain the pasta and green beans, quickly rinse under cold running water and allow to drain well. 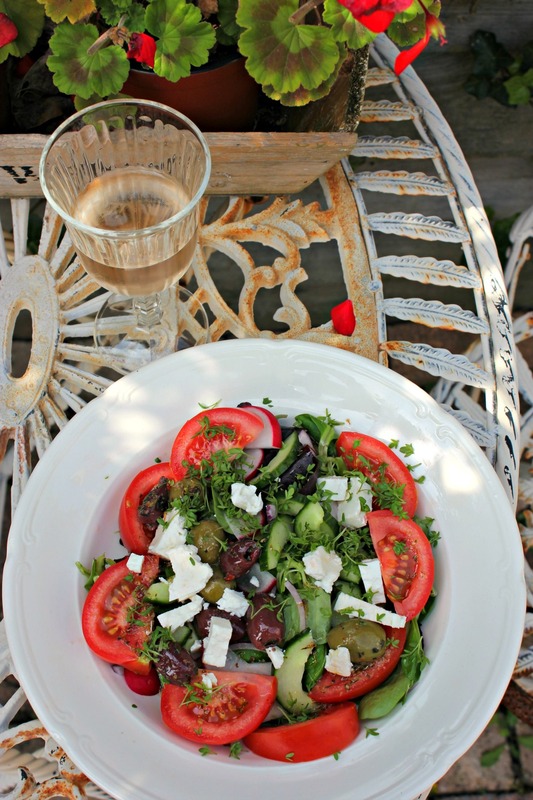 In a large bowl, whisk the olive oil, red wine vinegar, Dijon mustard, basil and salt and pepper. Add the drained pasta and green beans and the rest of the ingredients. Carefully stir. Cut the eggs into sections. Transfer the salad to a serving platter and garnish with the egg. 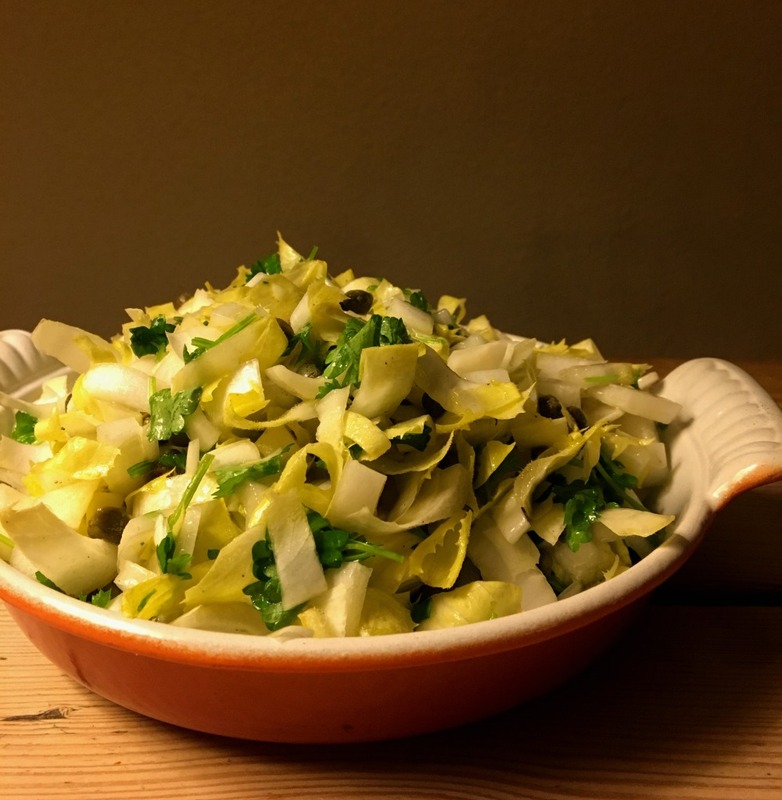 Yesterday, I promised to share my recipe for a lemony Belgian endive salad that goes exceptionally well with the lentil casserole I published. 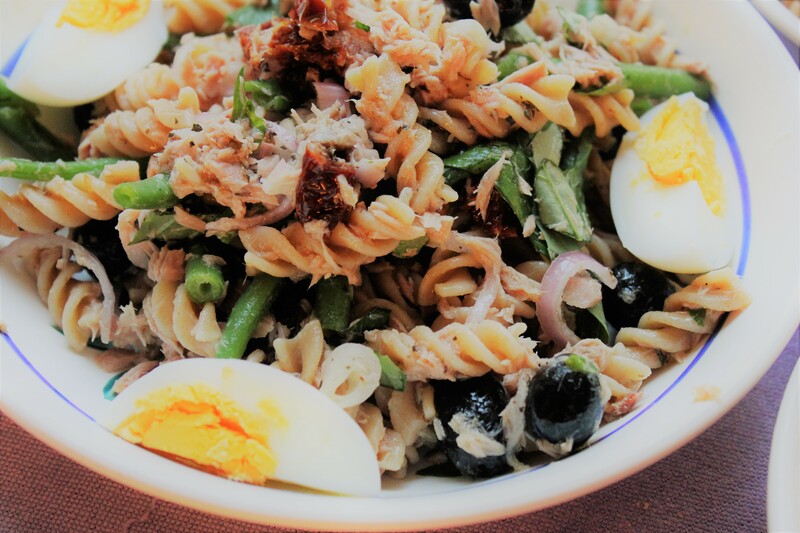 It’s a wonderfully crisp winter salad that also pairs well with fish. But before I get to the salad, here are a few Belgian endive facts I thought you would like to read. According to legend, Belgian endive was accidentally discovered during the Belgian Revolution in 1830. Before being forced to leave his farm in Schaarbeek, Jan Lammers had planted chicory roots under a layer of soil in a dark cellar. He was quite surprised when upon his return, he discovered that the roots had sprouted and grown white leaves. Lammers tasted the leaves and really liked their flavor. A few decades later, the product had made its way to every table in Belgium. Belgian endive was first introduced in Paris in 1872. There, people were so enthusiastic about it, that it was nicknamed ‘white gold’. Interestingly enough, the cultivation of the vegetable took off in France only after World War I. Farmers who fled Belgium took their chicory roots with them and began cultivating the plant there. It wasn’t until the1970s that the production of Belgian endive took off in the Netherlands. Today, the Dutch serve it as a side dish, in salads or in casseroles with cheese and ham. Outside of Europe, Belgian endive is regarded as a delicacy. In fact, it is ranked right up there with the likes of caviar, truffle and saffron! The vegetable is rich in vitamins and minerals such as Folate, Vitamin A and Vitamin K.
Combine all of the ingredients in a bowl and allow to rest for about half an hour before serving. Delicious with lentils or as a side dish to fish or roast ham. I hate, hate, hate the word diet. Probably because I’ve been on them all when I was in my teens and even later on in my early 20s. I shudder to think about how much time I wasted downing magic pills, powders, teas and other ridiculous potions. Or counting calories, weighing myself, depriving myself of the joy of eating, and trying to be something I wasn’t… and would never be — skinny. It took time (and a lot of episodes of Nigella’s cooking shows) to convince me that curvy was fine and that food should be a source of pleasure. At the ripe old age of 38, I am comfortable in my own skin and will never ever, ever EVER turn down a burger or a pizza (p.s. : my WORD did we eat a great pizza last Saturday at Woodstone in Almere!) Oh yeah, and I also eat sugar and bread! For me, it really is all about balance. I could care less what the latest scientific findings say I should be eating. My diet involves a bit of common sense, a bit of running and walking and a LOT of enjoyment. But what is ‘common sense’? To me that means eating a mostly organic diet full of fresh fruits and vegetables, consuming good sources of dairy (skyr, kefir and goat milk products), eating small amounts of meat and fish, staying well hydrated, and adding healthy foods to my diet such as turmeric (I drink a cup of turmeric tea every day), chia seeds and coconut. This, is something I do most of the time. 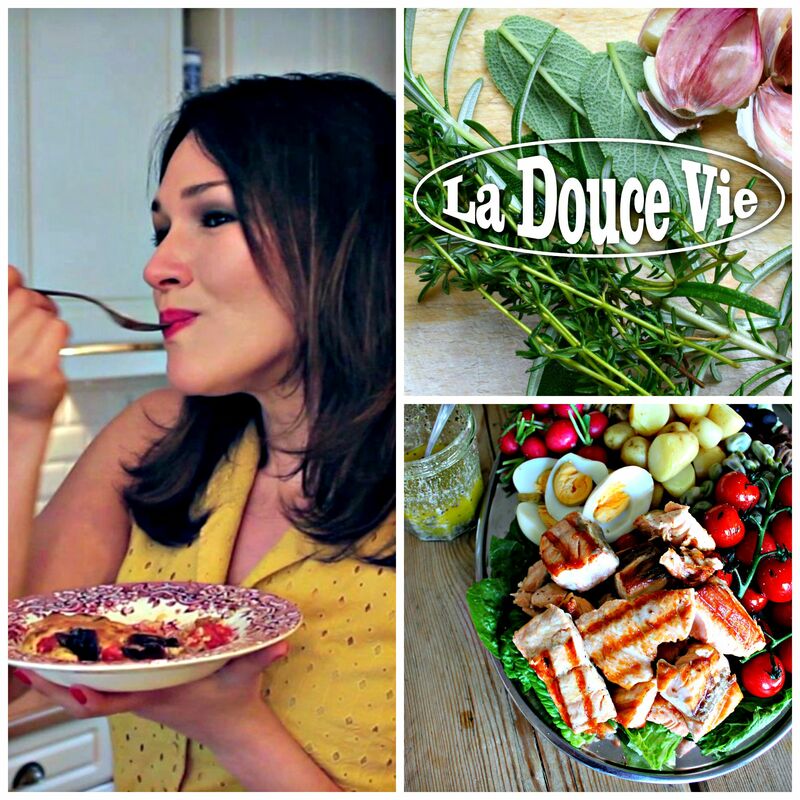 I often joke that calories don’t count on weekends…I think that also applies to our French vacations! During the week, I try to keep my carbs in check by substituting grains as much as possible. I adore cauliflower rice and mash, for example. Recently, I used the vegetable in a flavorful tabbouleh which I am sharing with you today. It’s a great no-cook, low-carb meal that you can tweak in many different ways by substituting other ingredients. If you want a less ‘raw’ dish, you can cook the tiny bits of cauliflower in a little olive oil for 5-8 minutes. Let it be said that I overindulged in freshly-baked croissants with confiture de lait this past weekend! Enjoy! In a large bowl, whisk the lemon juice, olive oil and salt and pepper into a vinaigrette. Put the cauliflower florets in a processor and blitz them until they resemble rice. 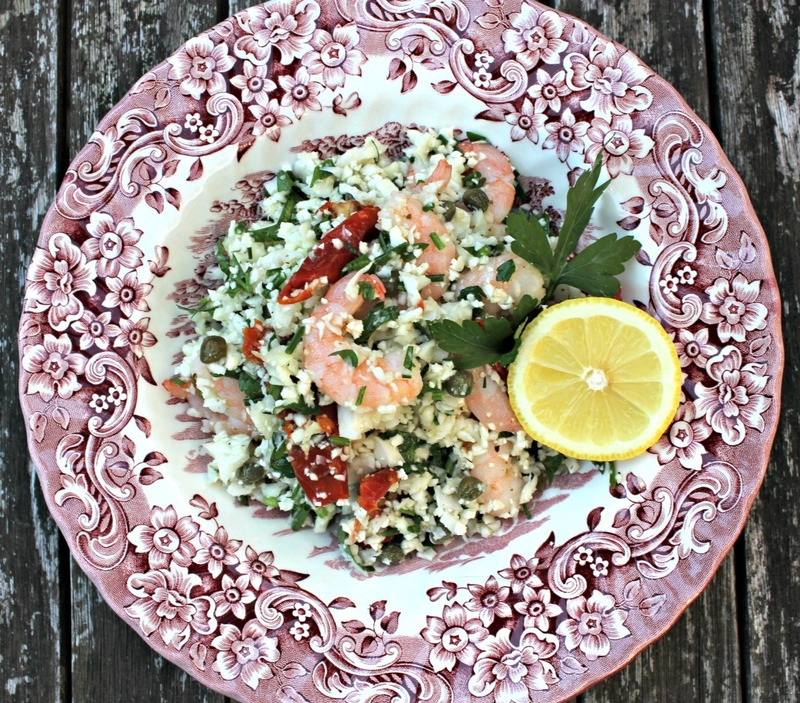 Add the cauliflower to the bowl along with the fresh herbs, capers, sundried tomatoes and shrimp. Stir everything well and leave in the fridge for at least an hour before serving.